Dozens Of Stranded Seals Flounder In Canadian Town As winter closed in on the town of Roddickton-Bide Arm in Newfoundland, a pod of seals became separated from open water by miles of ice. A harp seal lies on a road in Roddickton-Bide Arm on Friday. 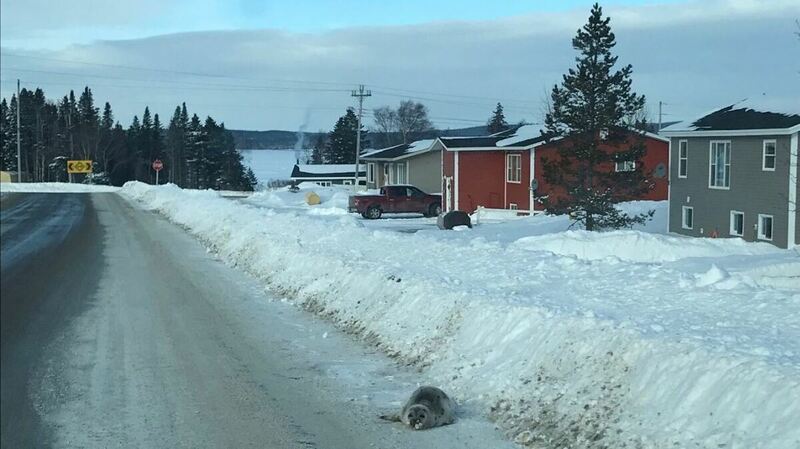 Dozens of the animals are currently stranded in the small Canadian town. Roddickton-Bide Arm, on the island of Newfoundland, calls itself the "Moose Capital of the World." But this week, that small Canadian town is on the map because of a different animal: the harp seal. The town's roughly 900 residents have been joined by at least 40 of the spotted gray seals — and they didn't come to see the moose. "This literally happened overnight," Mayor Sheila Fitzgerald tells NPR. "A week ago, we woke up ... we have two little brooks in town — they were full of seals." Fitzgerald says it's not uncommon to see a handful of the whiskered mammals in her town, which is perched on an inlet at the edge of the frigid North Atlantic. But as winter closed in this year, the seals apparently became stranded, separated from open water by miles of ice. "In the beginning, they were kind of aggressive," Fitzgerald says, recalling how the wild seals would bark at onlookers. Brendon Fitzpatrick, the mayor of nearby Conche, has been documenting the stuck seals on Twitter. "People chase them," he told the CBC. "People are there every day on snowmobiles stopping and looking at them, and the animals, they won't move from you." But the seals aren't just being obstinate. As the days have worn on, the mayor says, it has become clear that the seals are disoriented and don't know how to find their way back to the sea. "They're getting a little bit more lazy now, a little more tired and lethargic," Fitzgerald says. "These seals — as cute as they are — can't stay as residents in our village because there's not a food supply through the winter." She says that for the time being, the animals have been surviving on fish they catch in the town's streams. Harp seals travel south in winter months from the Canadian Arctic and Greenland to waters off the province of Newfoundland and Labrador, Garry Stenson of Canada's Department of Fisheries and Oceans told The Northern Pen. They bide their time on offshore ice floes as they feed and give birth. This year, he says, limited ocean ice might be forcing the seals to settle for coastal ice, which increases their risk of stranding. As NPR's Christopher Joyce has reported, sea ice in the Arctic has seen extreme melting in recent years, partly because of global warming caused by humans. Local officials had been in touch with the DFO, which sent officers to the village. But at a town council meeting Tuesday night, Roddickton-Bide Arm decided it was time to call for more help. "This has gone on long enough," Fitzgerald said, opining that if a whale had been stranded, federal officials in Canada might have reacted more quickly. But the town couldn't exactly take matters into its own hands. Canadian law prohibits the public from disturbing marine mammals. "We understand that it is tempting to interact with animals," cautioned the department in a statement sent to NPR. "However, a seal is a wild animal that should not be approached or touched." On Wednesday, the DFO deployed a three-person seal response team to set up base in the town, according to the mayor. Fitzgerald says residents will be able to call in seal sightings and have officials transport the animals back out to safety. An aerial reconnaissance mission to determine the size of the ice and the stranded pod has also been discussed, a plan the DFO says has been hampered by bad weather. While the rescue plays out, the seals are still put at risk by what turns out to be dangerously effective urban camouflage: Their coats blend right in with the snow and sanded roads. Two seals have been struck by vehicles, Fitzgerald says. "It's heartbreaking to watch this," she adds. "Nobody wants to see any animal suffer."